Every once in a while, this social networking madness produces something that truly is a great idea. I think one of those worthy novelties is Patients Like Me (PLM). Here is how this site is pegged by an analyst at Fierce Health IT. Disease-oriented consumer communities have been around since the early days of Usenet, so if all PLM did was bring them together in some cool Web 2.0 fashion, nobody would be too excited. But they’re onto something much bigger. PLM has built an open source-based Web application allowing patients to enter their symptoms and treatments and then, far more significantly, track outcomes based on a clinically-valid outcomes scale. 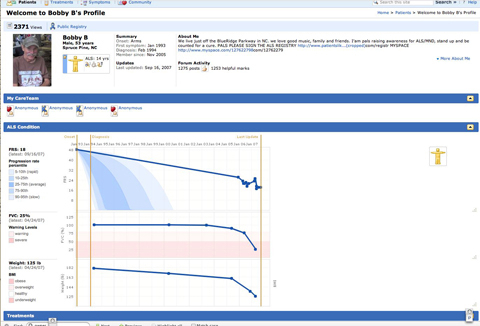 Not only that, the site allows patients to select for other patients with a similar profile (say, same age, stage of disease, gender), see what treatments that patient has had and what their outcomes were. Even more intriguing is that PLM, which just snagged $5 million in venture funding, then turns and sells the aggregate clinical data to researchers, hospital organizations, pharmas and others, offering a concentrated look at patients with a given disease state difficult to obtain even in academic research settings. This is heady stuff, and a model that has a chance to shift how researchers find the right parties for larger studies. 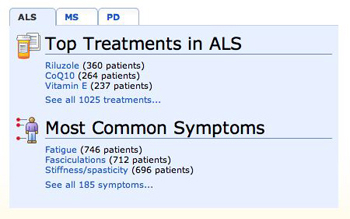 What to look for: Right now, PLM has only rolled out one outcomes module and community, focused around ALS. Expect to see about 10 disease rollouts this year, including a multiple sclerosis and Parkinson’s communities. Will the pharmas and researchers start buying? You bet. As an example, consider this chart above taken from the site. Users of PLM are not just exchanging their latest twitters. They are sharing their medical charts. They are comparing their drug regimes and comparing results. They are tracking the latest science findings together. They are seriously active in their own treatment (like many in the past) but using the latest social knowledge tools to up their chances. If I were seriously sick (or maybe even a little ill) this is how I want to proceed. In a very mild way the members of Patients Like Me are performing a low level clinical experiment. Since each patient is responding to the treatment of the other, this experiment has a slightly cybernetic squirliness to it, but it also has the potential to be uplifted by the wisdom of the crowd. If this particular manifestation of the idea (PML) works, I would expect it to become a very powerful platform for future healthcare.